Four down, eleven to go, and a visit from my other favourite boat #narrowboat #England #Audlem – The Diesel-Electric Elephant Company. The foul winds have abated, and advantage has been taken. Actually, the activity was spread over the two days since the gales stopped, and included such unlisted highlights as a fumble around the local Co-op shop and a visit to Audlem’s chippy for a bag of chips and a small mushy peas please mister and don’t spare the S&V. 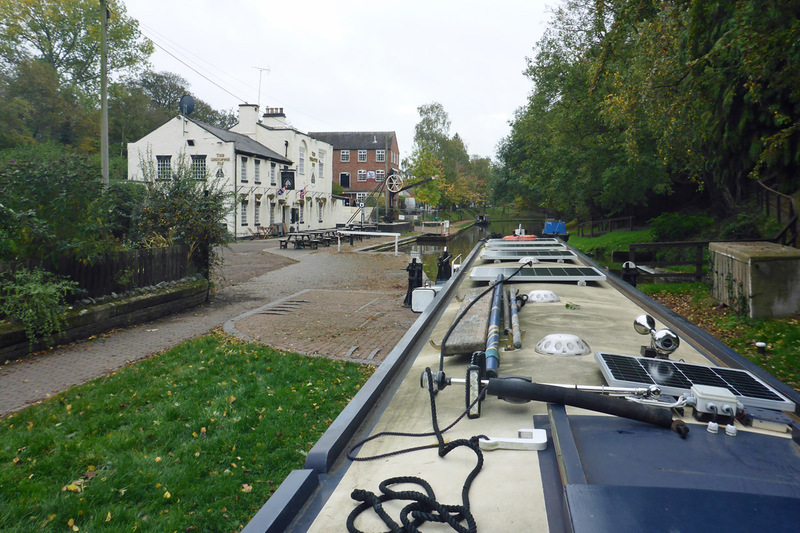 The third lock is the one shown in the main photograph at the header, taking us up to the level of the Shroppie Fly (another doomed public house – the lease is advertised as up for auction…). This lock is a bit of a leaky lock, due for some work I think in the “winter stoppages”. Tis necessary to have two paddles open for the pace of the water in to match the pace of the water out so that the top gate can be opened. The fourth lock was a bit of a le bugger, if you’ll pardon my French. 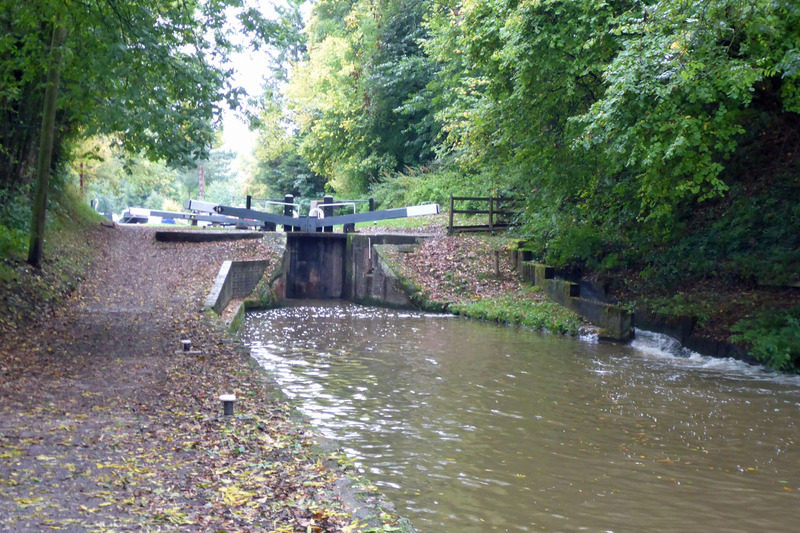 The lower lock landing is on a curve, has soggy and uncertain banks, has a version of the “Shroppie shelf”, and all three bollards to tie to temporarily are nowhere near where anyone might need to tie to temporarily. The approach, when going up the lock as I was, is under a road tunnel and thus narrowboat width (only) with no room whatsoever to manoeuvre to counter the very strong by-wash coming at the boat from starboard. Getting the Cardinal in to the lock was therefore, sadly and embarrassingly, more revs than usual, more speed than ought, and a clonk and a thud. There was no more gentle way. Lock landings on curves, dodgy banks, Shroppie-shelf nonsense and the by-wash from, well, not Hell as such, but certainly from somewhere in the sulphureous neighbourhood. Still, we get ahead of ourselves (no mean feat on a narrowboat). We began the domestics by mooring nearest a water point overnight. By morning another boat had moored at an impolite distance even nearer to the water point, squeezed in inches from the Cardinal’s bow. An insufficiency of hosepipe indicated a de-mooring, a quick hop around the overnight impertinence, and thence back to the towpath within hosepipe distance. So, that is how we began, with my returning the favour with a spot of narrowboat-leapfrog. H2O. Of all of the liquids on this planet, water is quite my favourite. Roughly 300 litres later the Cardinal’s 545 litre main tank was brimmed, and we were cheek by jowl with the first lock, which is what are known as “Lock 15” of the flight, since they have apparently numbered the flight backwards. Gazunder facilities and dustbins are a hundred yards up, past the lock, to the left, next to the pub. You can see the by-wash to the centre-right of the photo. this one is nice and mild-mannered. The “by-wash” is essentially the over-flow from the upper stretches of canal. So that the (mild) flow of water can continue when the lock gates are closed (and not flood everything) there is a channel past every lock to take the excess. The Victorians, being economical with their money, profligate with the energies of their workforce, and disinterested in the interests of single-handed twenty-first century boaters, didn’t channel the excess water very far past the locks. The by-wash is usually aimed at the boat’s bow, exactly at the point where some future numptie is trying to thread a 6′ 10″ wide boat into a 7′ 6″ lock using a propeller and rudder some 57′ back from the action. The advantage of the “fourth” lock that I did done, Lock 12 in official parlance, is that as we rose within it I could see the moorings that I was taking aim at. 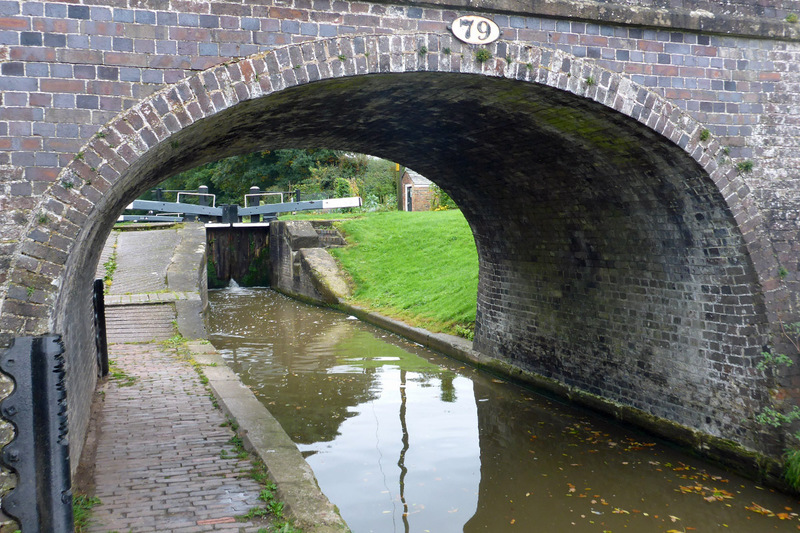 The lock landing at the top was as dismal as the landing below – on a curve, with the Shroppie shelf. Still, tis done and tis good tis done. Fuel Boat Halsall coming down the lock ahead of us, ready to zig-zag from boat to boat with their deliveries. A most welcome sight indeed. Five bags of coal please, two of kindling and a bottle of Gazunder chemical. The wonders of technology being what they are, I stood on my boat on a Victorian canal and paid by bank card. Please enter your PIN. * * * *. Transaction authorised, please hand the machine back to the chap on the fuel boat. We now have nine bags of the black stuff aboard, enough kindling to see Mr Stove through any moods that possess him during this too-warm too-cold wind/no-wind season, and an over-sufficiency of Elsan Blue. A bag of coal lasts something on the order of four to six days (24×7) depending upon the level of coolth abounding, longer as now, with the temperature up and down like a politician’s knickers. Today will be spent fiddling with a few more domestic items, nipping back to the Co-op for the (forgotten) fire-lighters, and girding my loins for mooching on again. I shall gird my loins in the customary manner, by sitting down and looking at the locks from a distance until they submit to my will! Splendid stuff. If I listen really intently I can hear my solar panels feeding. Sorry – interference from cat caused a unexpected end to that comment. …n.the arse, but the canal scenery is very extra in these areas, isn’t it? I hope the next flight is easy peasy for you. All this and a bag of chips and mushy peas with a waft over of the vinegar, oh to be in England! I imagine the feeling of achievement after all those locks will be amazing and worthy of a tincture of that other vinegar only the co-op can offer that you don’t sprinkle on your chips.Still there is a certain tranquility about these posts that I find remarkably calming especially when it takes me away from the angst of the FB frenzy – ah breathe in, breathe out – may your journey proceed with great calmness.